Deliciously rich, moist and intense chocolate cake with a hazelnut truffle buttercream filling and covered in chocolate ganache, it’s perfect for any special occasion. No one will ever believe this is dairy free! 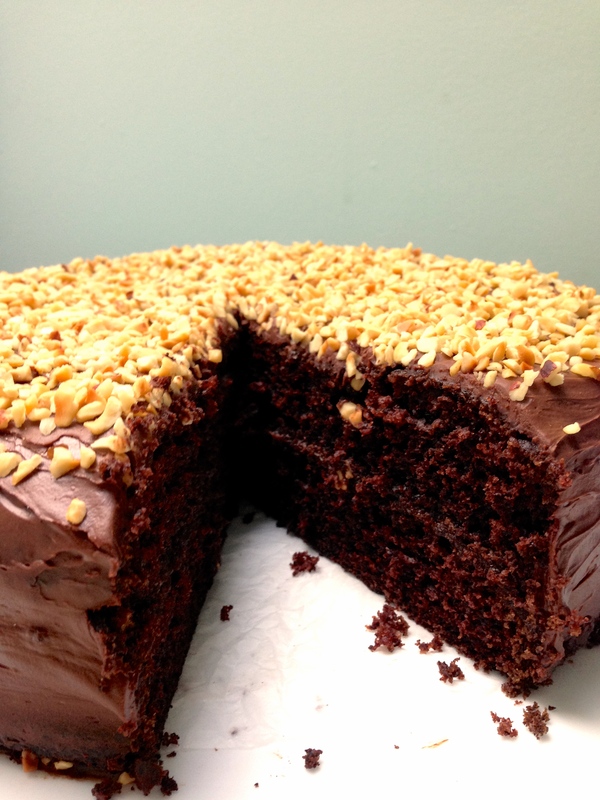 Is there any cake as universally loved as chocolate cake? Certainly not in my experience, and what’s wonderful about chocolate cake is the huge variety you can make. 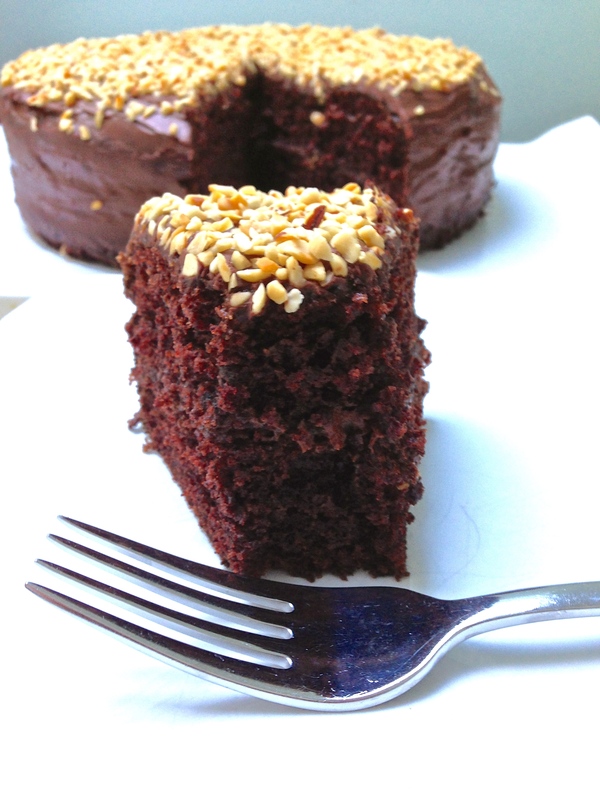 A chocolate cake can be light, sweet and perfect for an afternoon treat or it can be rich, dark and decadent. This cake without a doubt falls into the second category. The chocolate sponge gets its depth of flavour and soft texture from some surprising ingredients – melted chocolate, coffee and coconut yoghurt. The chocolate and coffee provide the intense chocolate flavour – be sure not to skip the coffee, you really can’t taste it but it helps bring out the chocolate flavour like nothing else. The coconut yoghurt is added to help the cake stay soft and moist and it provides a slightly tangy unsweet flavour which works well in such a rich cake. You could use any type of plain non dairy yoghurt but I preferred coconut. You can’t taste the coconut flavour, but it provides the tang of normal yoghurts which I find most non dairy yoghurts lack. 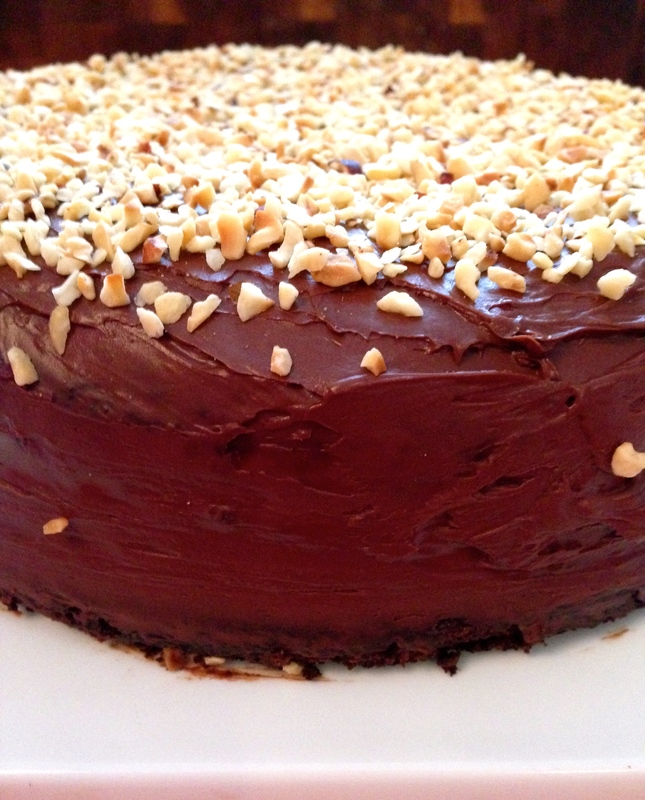 To finish off the cake I’ve covered it with chocolate ganache and chopped roasted hazelnuts. Ganache is just chocolate and cream but it makes the perfect cover for a special occasion cake, shiny and smelling divine it makes the cake irresistible to all… even to those rare people who say they don’t like chocolate cake! Happy New Year! I find it strange the way January starts the year. After all the excitement in December, January can seem dull and plain with little to look forward to. So today I created these cupcakes, full of wonderful summery flavours to remind us that winter will shortly be giving way to the brighter seasons. 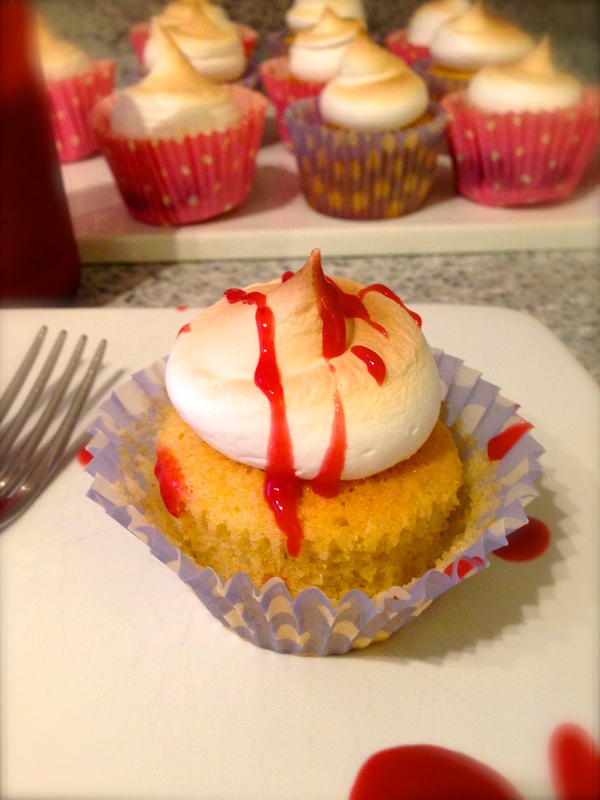 These cupcakes are lightly flavoured with lemon and then with a hit of raspberry in the centre – provided by my homemade Raspberry Curd in this instance – but you could easily do this with raspberry jam if making curd is a step too far! Raspberries are, in my opinion, one of the best summer fruits. Once they are back in season I will do a step by step post on how to make raspberry curd – it is well worth the time and effort. — Update! — If you would like to see how to make the Raspberry Curd, the full recipe is here. 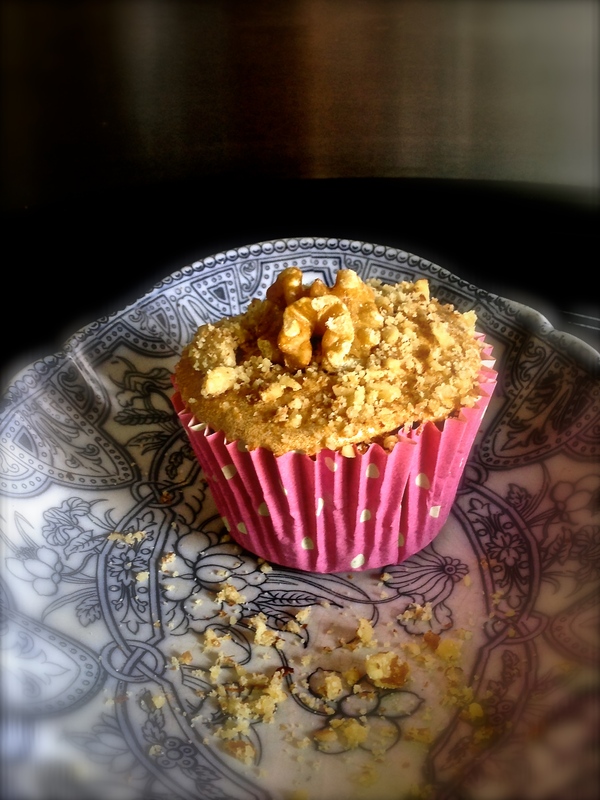 These cupcakes were a bit of an experiment and one I will certainly be making again. Orange blossom water was also a new ingredient for me, and it provided a very grown up and delicate orange flavour to the buttercream icing. 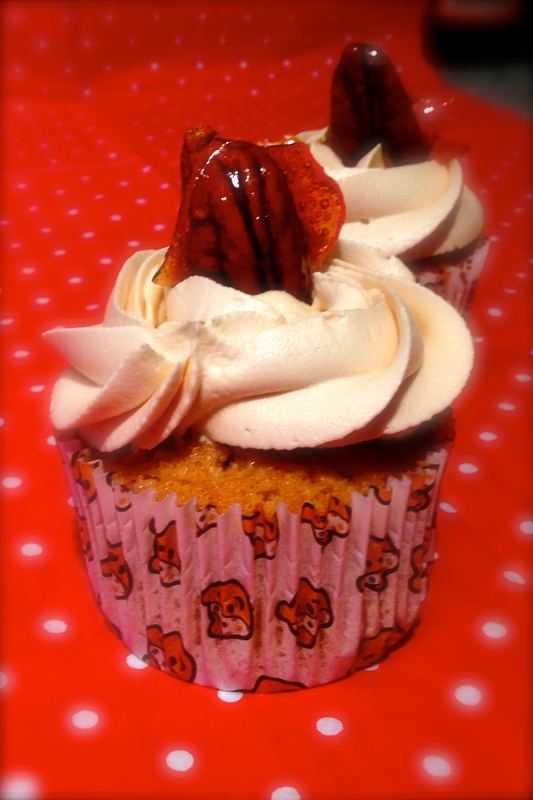 Another success with these cupcakes was a new recipe for dairy free buttercream. After a lot of research on the internet, I read about a vegetable oil based ‘butter’ called Trex. What a great discovery this was! Trex has a similar consistency and look to lard – very hard, slightly crumbly and very white in colour. My usual buttercream recipe uses just dairy free butter, such as pure, but this can be very soft given that Pure has a similar consistency to margarine. For this buttercream I reduced the amount of dairy free butter and replaced it with Trex – and voila – a smooth, creamy and stiff buttercream! It was a dream to pipe and kept its shape beautifully. 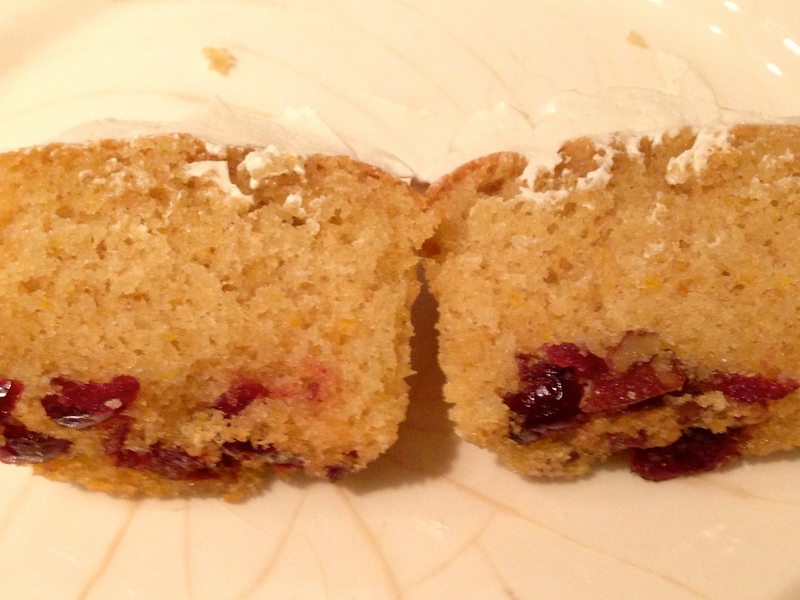 The cranberries in the cake are a hidden surprise. For these I sprinkled the cranberries in the bottom of each case and the spread the batter on top. Next time though I would definitely incorporate the cranberries into batter. 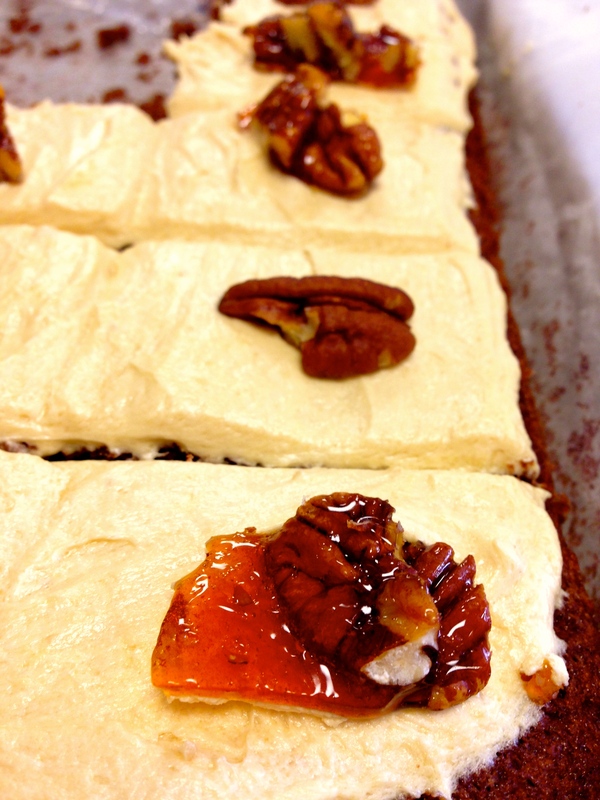 I topped each with a piece of Pecan Brittle (recipe can be found in my Chocolate Caramel cake) for decoration… plus made some extra for me to eat, but that’s just between you and I! 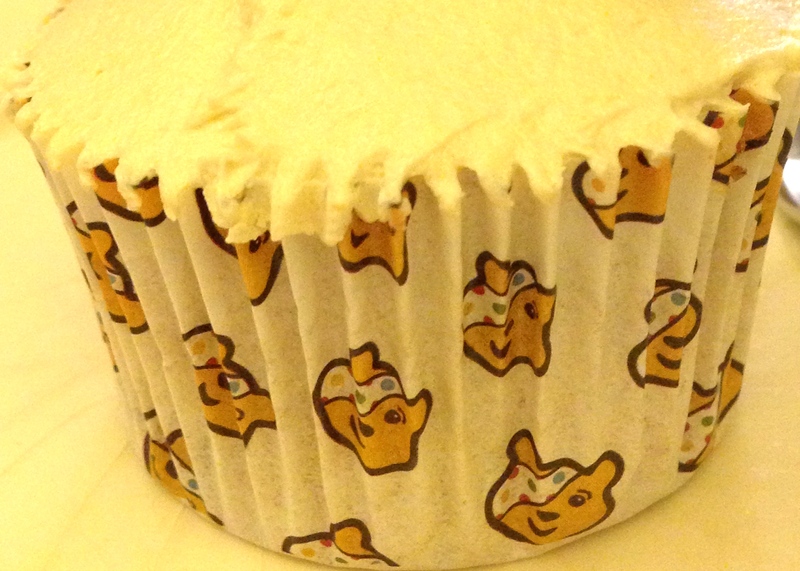 And incase you’re wondering… yes, that is Pudsey Bear on my cupcake cases. Lakeland are currently selling them and donating part of the cost back to Children In Need. So this week, as I’ve been talking about my blog at work, I was challenged to come in with some office treats. I think I definitely overstretched myself on a Wednesday evening! 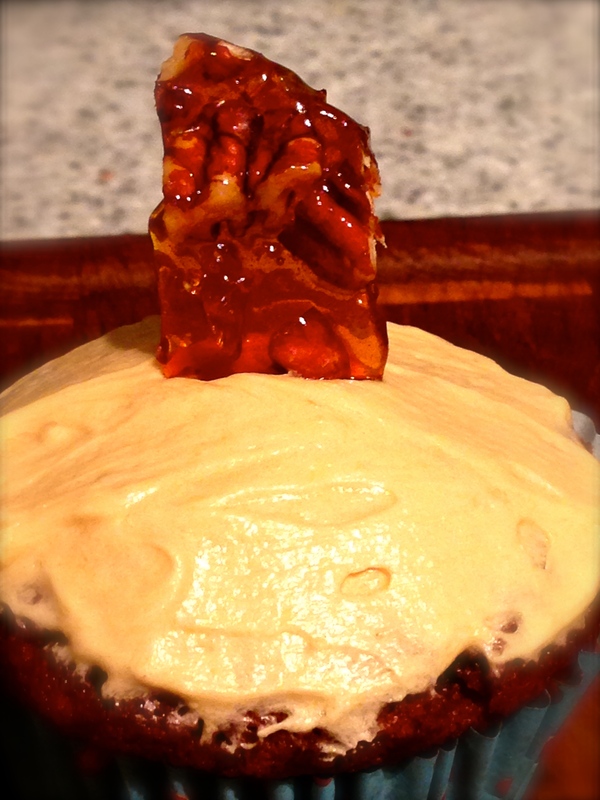 For in I came with a made up concoction – Chocolate caramel cake, topped with caramel icing and salted pecan brittle. I agree – even I was impressed that I managed that all in an evening after work… The end result was great though – a light, moist chocolate sponge, buttery (although made without normal butter!) 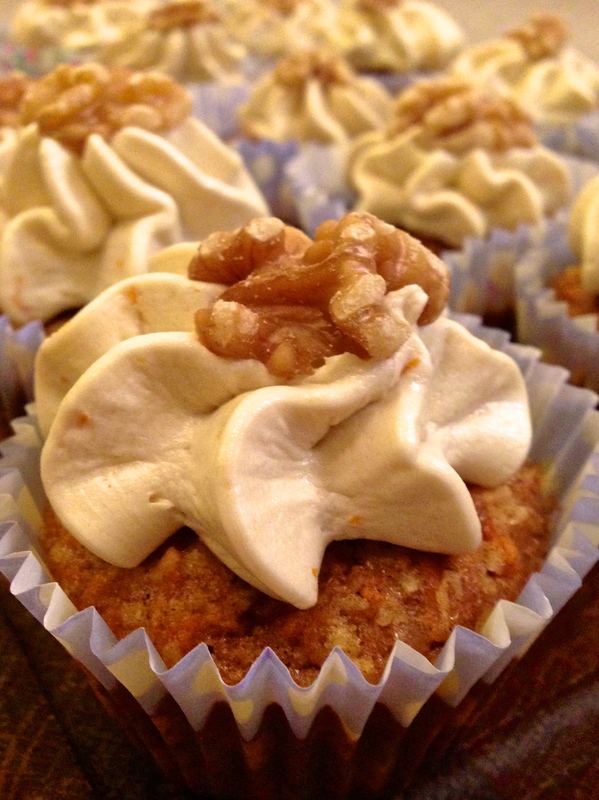 sweet caramel buttercream icing, with a crunchy piece of nutty brittle on top – delightful. And the best comment from a friend who tried it – they would never have guessed or been able to tell it was dairy free. Music to my ears! I will admit that I had to do the caramel sauce for the icing twice. The first time my thoughts were on dinner so I overcooked it slightly… and in the bin it went! Also, having neglected to properly check ingredients, I did not see that I only had about a third of the required amount of cocoa powder, so a certain amount of improvisation was needed that I would not do again. I added 60g of a dark 80% chocolate bar which I thought would compensate, but the resulting sponge was not chocolatey enough my colleges and I decided. This cake is from Mary Berry’s Baking Bible – a book that’s been instrumental in my baking journey so far. 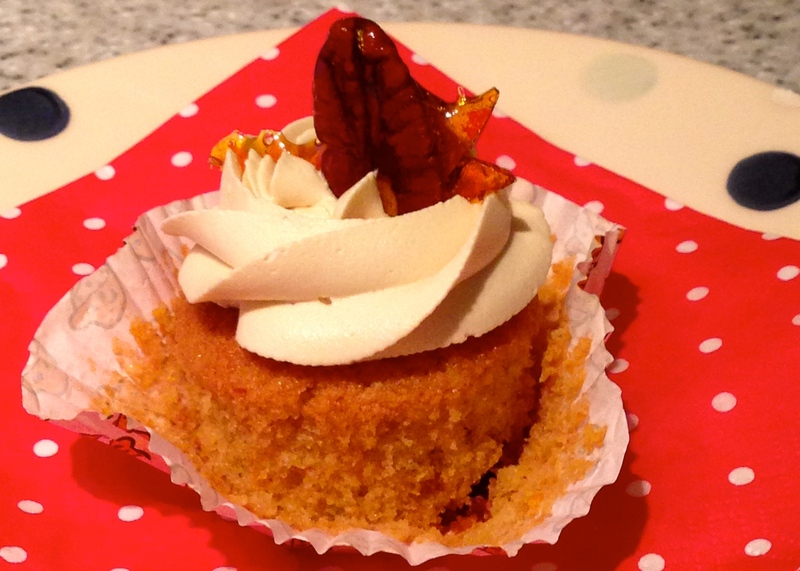 The original recipe is for a large tray bake, and this version is simply scaled down for cupcakes. 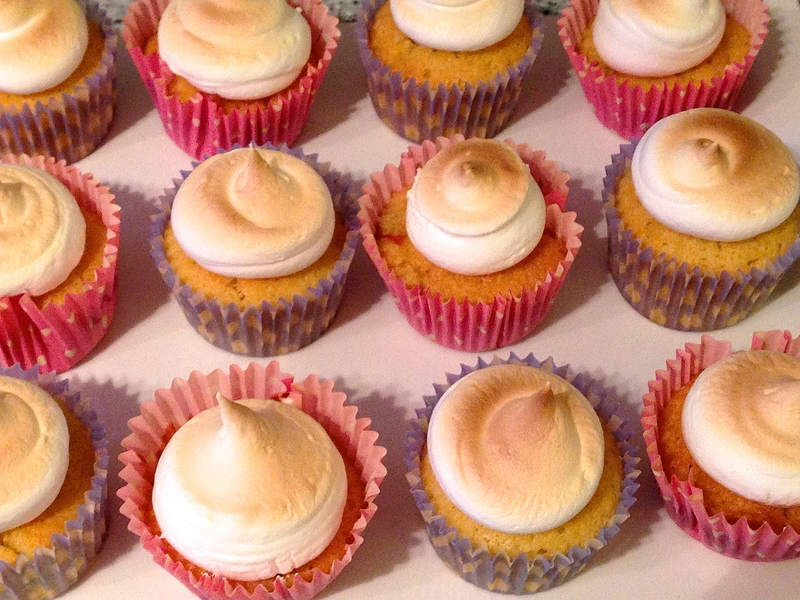 I have to say I would definitely do them as cupcakes again, it really helped keep the sponge more moist which really worked for these flavours. 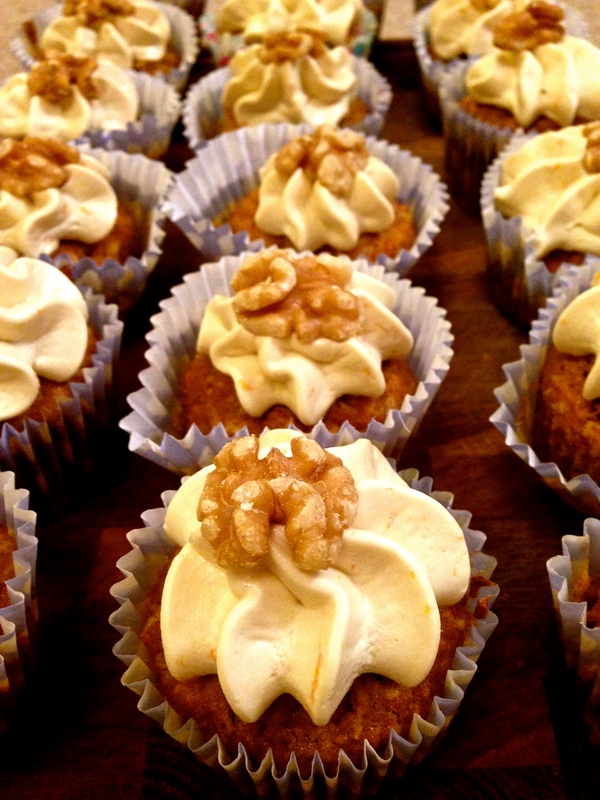 I like a healthy amount of walnuts in these cakes, so am always more generous than the recipe states.